A soft robotic gripper for a Tele-operable In-Home Robotic Assistant (TIHRA) for the mobility impaired is presented. This gripper is inspired by the Fin Ray® Effect, which is derived from the physiology of fish fins. The gripper fingers are soft and triangular with hard crossbeams that buckle and deform in to conform around objects. 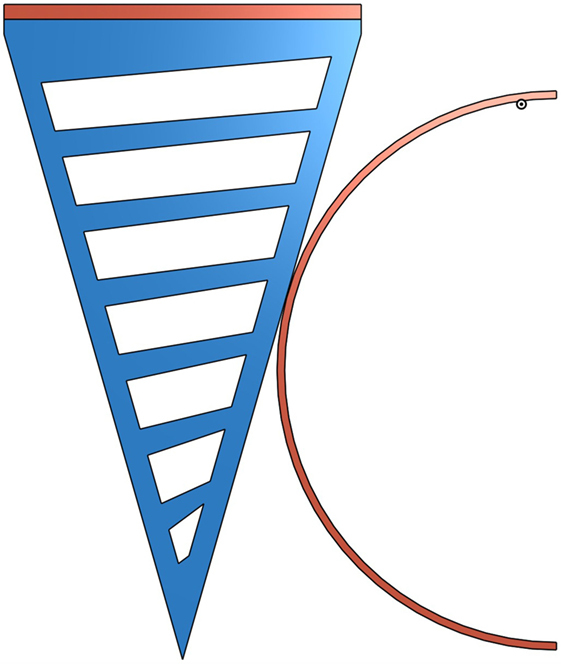 The fingers of the TIHRA were altered from the original Fin Ray® design in order to create a preferred bending direction, resulting in less force required to obtain a good grip on an object. The entire gripper can be 3D printed as part of a soft robotic hand made from hard and soft materials, and the motor–tendon actuation system attaches in a limited number of steps. Testing of the gripper included modeling the fingers and comparing grip strength them to the original Fin Ray® to verify their optimization. Models show that the TIHRA fingers deform 15% more than traditional fingers when subjected to the same force. The TIHRA gripper was capable of holding 560 g, approximately 40% more than the gripper equipped with traditional fingers. This difference was statistically significant (p ≪ 0.001). The TIHRA hand was also tested at the 2016 RoboSoft Grand Challenge in Livorno, Italy. The gripper successfully completed some tasks, highlighting its conformability, deformability, and morphology, but performed poorly in others, demonstrating the need to increase the gripper strength to prevent out of plane twisting and bending and to increase the force that the gripper can exert. The gripper was attached to a Baxter robot to demonstrate its ability to interface with existing technology, and other versions of the gripper were designed and manufactured to show the scalability and versatility of the design. People living with an upper mobility impairment, such as those due to disease (ALS, MS), injury, cerebral palsy, stroke, and congenital defect, must often rely on a care provider to perform basic tasks, such as eating, drinking, brushing their teeth, and reading a book. Robotic assistants provide a way to give these people autonomy and enable them to do things they would not otherwise be able to do. However, several barriers must be overcome before they are readily adopted in this community, most notably of which are safety and cost. This led us to pursue a safe and inexpensive Tele-operable In-Home Robotic Assistant (TIHRA), a soft robotic gripper and arm that can be controlled by the mobility impaired person or their care provider. As robots navigate environments that are both increasingly more complex and more likely to bring them into contact with humans, changes in their design are needed to ensure that they are able to safely interact with people. This is especially important when designing robots for people with a mobility impairment. These design changes have often manifested in the addition of soft components but have also resulted in robots composed almost entirely of soft materials. Robotic manipulation has seen an increasing number of these changes. Robotic manipulation, particularly anthropomorphic manipulation, began with grippers and biomimetic hands made from hard plastics and metals that were primarily motor–tendon driven (Okada, 1979; Jacobsen et al., 1984, 1986; Al-Gallaf et al., 1993). Even today, researchers and companies are continuing to develop biomimetic robotic manipulators that are predominantly hard (Bar-Cohen and Breazeal, 2003; Price et al., 2007; Bundhoo et al., 2009; Gilardi et al., 2010; Shin et al., 2010) despite the fact that only just over one-tenth of the human body’s weight is skeletal (Kim et al., 2013). The soft nature of the human hand enables it to pick up and interact with a wide variety of objects from a fragile eggshell to a heavy rock. The incorporation of soft components into primarily hard robots is a step forward in creating robots that are increasingly biomimetic and increasingly able to handle the same wide variety of objects humans can. The addition of soft fingertips (Arimoto et al., 2000; Shibata and Hirai, 2006; Trivedi et al., 2008; Berselli et al., 2011; Bakhy et al., 2013), especially those with embedded sensors (Hosoda et al., 2006), seeks to extend the benefits of skin to robots, while the addition of nails to robotic hands (Murakami and Hasegawa, 2003; Iwata and Sugano, 2009) provides increased dexterity and aids in picking up thin objects. One such example of a hand incorporating soft components into a robot is the iHY hand (Howe et al., 2014; Odhner et al., 2014), which combines fingerpads, nails, and embedded sensors with flexible joints and tendons to create a new, biomimetic take on traditional motor–tendon driven robots. The combination of hard and soft parts results in robotic manipulators that are similar to vertebrates with hard material providing structure and strength, such as bones, and soft material providing skin, actuation, and sensing. One step further than the addition of soft components to manipulators is soft robotic manipulators, which are predominantly or totally composed of soft materials. This provides them with many advantages, such as greater ability to grasp objects (Pfeifer et al., 2012), increased conformability to a wide variety of objects and environments (Shen, 2016), and high deformability and capability to absorb energy (Kim et al., 2013). These soft robots are highly capable and diverse, including pneumatic grippers (Ilievski et al., 2011; Martinez et al., 2013; Maeder-York et al., 2014; Katzschmann et al., 2015; Galloway et al., 2016; Yeo et al., 2016), manipulators inspired by the octopus (Calisti et al., 2011; Cianchetti et al., 2011; Mazzolai et al., 2012), electroactive polymer grippers (Alici and Huynh, 2007), and granular jamming (Brown et al., 2010). However, even these soft robots, like their hard counterparts, suffer from limitations. The majority of robots are not scalable or versatile in terms of control and actuation methods nor in terms of material. An additional downside to most robots is complex fabrication and assembly processes. For example, many soft robots require multiple molds and steps to fabricate, resulting in a process that takes a day or more to complete. These limitations drove us to seek a soft robotic solution that is simple to fabricate and assemble, contains a limited number of actuators, is scalable in size, and can be easily modified to accommodate different materials, control schemes, and actuation methods. The Fin Ray® Effect met all of these criteria. The Fin Ray® Effect was discovered by biologist Leif Kniese of Evologics while fishing and is based on the deformation of fish fins (Hosale and Kievid, 2010; Pfaff et al., 2011). The structure of the fish fin is composed of two bones arranged in a V shape with connective tissue in between. Pulling on one side of the V causes the fin to deform. This was adapted by Kniese into an A-frame structure with crossbeams spaced between the tip and base as shown in Figure 1A. Applying a force to the structure causes the structure to bend, as shown in Figure 1B. The traditional structure shown in Figure 1 is symmetric and capable of bending equally in either direction. Figure 1. The Fin Ray® Effect can be demonstrated by applying a force to the structure shown. The force causes the sides of the structure to bend, resulting in the base and tip deforming toward the applied load. (A) An unloaded Fin Ray® structure. (B) A loaded Fin Ray® structure. The Fin Ray® Effect is scalable and versatile. It has been employed in grippers, like the DHDG and the FinGripper from Festo, which are made from layers of polyamide powder (Festo, 2009, 2011, 2012, 2014). The effect has been scaled up as part of an art installation called the InteractiveWall. The wall was 5.3 m (17.4 ft) tall, and people were capable of interacting with it by pushing on either side. Its “bones” were composed of a carbon composite and the crossbeams were aluminum tubing (Hosale and Kievid, 2010). The effect is also easy to design, modify, and manufacture, with numerous of designs available on Thingiverse, a website to which people can upload and download 3D designs. 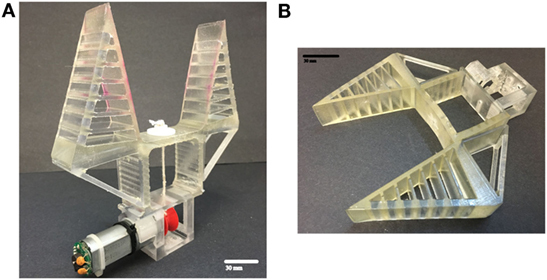 In this paper, we present a soft robotic gripper inspired by the Fin Ray® Effect that is 3D printable, capable of being scaled for different applications, versatile in actuation method and material composition, and easy to assemble. This soft robotic gripper builds on the Fin Ray® Effect to optimize the task of gripping objects a wide variety of objects as part TIHRA. The following sections detail the design, modeling, and testing of the TIHRA gripper, and its performance at the RoboSoft Grand Challenge in Livorno, Italy on April 30, 2016 (RoboSoft, 2013). Inspired by the Fin Ray® Effect and Festo grippers, the TIHRA fingers were designed as part of a motor–tendon system-driven gripper. The TIHRA gripper fingers were evaluated against the traditional Fin Ray® grippers by both modeling and experimentation. 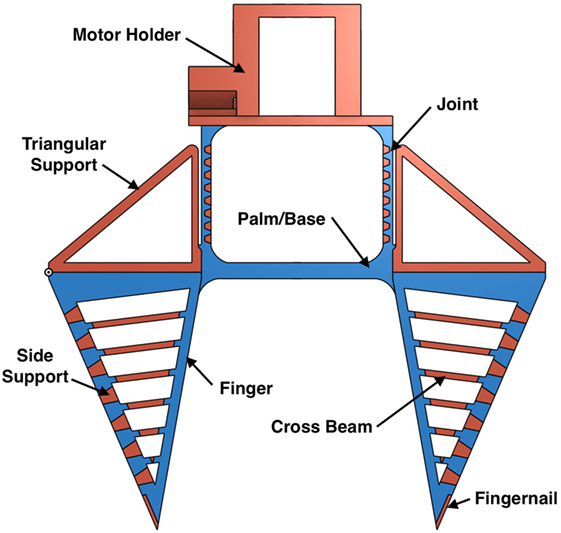 The purpose of modeling the fingers was to analyze conformability by determining how far each finger moved toward an object for an applied force. The physical experiments measured grip strength, which is an important factor in determining what objects the gripper is capable of picking up. The TIHRA gripper’s performance in each task at the RoboSoft Grand Challenge was evaluated to study how the gripper would perform in the field. The TIHRA gripper, which can be seen in Figures 2 and 3, is composed primarily of soft material but does incorporate hard material to increase its ability able to withstand deformations from an applied load. The hard material acts as the bones of an animal would, providing structure and strength, while the soft material acts as connective tissue, muscle tissue, and deformable joints. Figure 2. The TIHRA gripper is composed of hard and soft parts and printed as one part on a Connex Objet500 3D printer. (A) The TIHRA gripper with motor and tendon/pulley system attached. (B) The older version of the TIHRA gripper that competed in the RoboSoft Grand Challenge. Figure 3. Front view of the TIHRA gripper with labeled parts. Hard and soft material are represented by red and blue, respectively. Several changes were made to the traditional Fin Ray® design in order to incorporate soft materials and to optimize grip. The TIHRA gripper finger, unlike the traditional Fin Ray® design seen in the Festo FinGripper, is not symmetric about its central axis, a modification made to both strengthen the finger and promote preferential bending. When first exploring the effect with quickly assembled paper models, we often were not able to achieve a symmetric model. However, in going through this process, we began to notice that this asymmetry made it easier to bend the gripper in one direction than the other. By angling the crossbeams relative to the base, we created a preferred direction of bending and decreased the force required to deform the finger, thus promoting bending toward the center of the gripper and around the object in the gripper’s grasp. We also increased the thickness of the outer wall of the finger and reinforced it with hard material to prevent out of plane deformation when a load is applied, i.e., to minimize lateral deformation. The last modification was the addition of a fingernail at the tip of the finger to aide picking up smaller objects. These side supports along with the crossbeams and fingernail are the only hard parts in the finger. Two fingers are attached to a soft palm and a set of joints. These joints are composed of soft material with trapezoidal prisms spaced along them parallel to the palm. The orientation and location of these trapezoidal prisms cause a preferred bending direction, which is used to push the fingers around an object when the hand is actuated. To actuate the hand, a motor–tendon system was employed, whereby a tendon is attached to the base of the palm and to a pulley on a Digilent 12 V DC motor located at the base of the hand. Rotating the motor in one direction, causes the tendon to shorten, pulling the palm toward the base of the hand, and collapsing the joints outward into the triangular supports. As the palm retracts and the triangular supports are pushed away from the center of the hand, the fingers are directed toward the center and around the object. The hand can be entirely 3D printed as one part on a Connex Objet500 using TangoPlus as the soft material and VeroClear as the hard material (Stratasys, 2015). Attaching the actuator after the hand has been printed requires screwing in four screws and attaching the tendon to the motor shaft. The fingers were modeled in Nastran In-CAD 2016 (Autodesk) to demonstrate the advantages of the TIHRA gripper over the traditional gripper. To simulate the finger deforming around an object, a cylindrical object was placed tangent to and near the midpoint of the inner side of the finger, as shown in Figure 4. The finger was modeled as a soft piece made from silicone while the hard base of the finger and the cylindrical object were modeled as ABS. The parameters of both materials were preloaded into Nastran In-CAD and are the materials used to create and test early versions of the finger, which were created from Dragon Skin 30 (Reynolds Advanced Materials). Figure 4. The arrangement TIHRA finger placed next to a cylindrical object that was modeled in Nastran. Hard material, represented by red, was modeled as ABS, and soft material, represented by blue, was modeled as silicone. A non-linear static analysis was performed on the finger and cylindrical object with parabolic tetrahedral elements. The model was run twice for each finger. The bases of the fingers were subjected to a 5-N force in the first trial and a 10-N force in the second. To compare our optimized design to the original Fin Ray Effect® design, grippers with the TIHRA finger design and the original finger design were 3D printed and subjected to grip strength testing. Each gripper was equipped with a Digilent 12 V DC motor and mounted to a frame with the fingers pointed down, as shown in Figure 5. The motor was connected to a Digilent Motor Adapter and a myRIO (National Instruments). Opening and closing the gripper was controlled by a Logitech Extreme 3D Pro joystick and LabVIEW 2015 (National Instruments). Figure 5. Images showing the test setup for strength testing the grippers. The gripper was given a cup loaded with sand to grip. Opening and closing were controlled by a joystick connected to a myRIO. (A) Unloaded gripper. (B) Loaded gripper. Gripper strength was tested by handing the open gripper a cup loaded with sand. The gripper was then closed, and if it held the loaded cup for 10 s without slipping, the weight was recorded, the gripper released the load, the load in the cup was increased, and the process was repeated. The gripper was given three chances to grip the load. To increase repeatability, sand was packaged into approximately 20 g packets. The lightest packet weighed 20.0 g, and the heaviest weighed 21.5 g.
In order to test gripper performance under lateral loads as well, the gripper was mounted, so that it was parallel to the ground, and the loading process was repeated. The RoboSoft Grand Challenge was a 1-day soft robotics competition held in Livorno, Italy on April 30, 2016. Participants in the Challenge could choose to compete in, the manipulation portion, the locomotion portion, or both. The aim of the event was to promote and inspire innovation in these two areas of soft robotics. An older version of the TIHRA motor–tendon driven gripper with slightly different joints was used in the manipulation portion of the RoboSoft Grand Challenge and is shown in Figure 2B. Teams competing in this part of the competition were presented with three challenges: pick up four different objects and deposit them into a container, navigate through three different obstacle scenarios to touch a can, and open a door. For the first challenge, teams were given a selection of objects to choose from. The objects were approximately 100 mm by 100 mm by 100 mm and were presented one at a time to the robot. The robot was given three attempts to pick up the object and deposit it in a box of size 200 mm by 200 mm by 100 mm. The three parts of the second challenge were to touch a can unimpeded by obstacles, move around a cylindrical pillar to touch a can, and move through three cylindrical pillars to touch a can. The third challenge required the robot to grasp a door handle, turn it, and open the door. 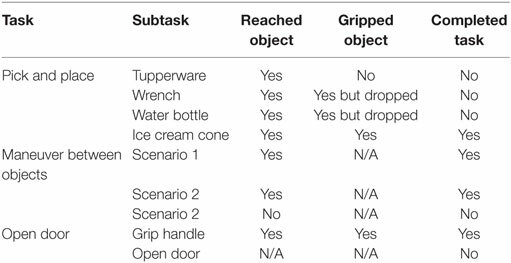 Though RoboSoft had its own criteria for grading the robots (RoboSoft, 2013), we defined our own as follows: ability for the robot to reach the object, ability to grip the object, and ability to complete the task. For the challenge, the TIHRA gripper was attached to a laser cut, four degree-of-freedom (DOF) acrylic arm: one DOF lifted the arm at the base, one moved the arm side to side, one lifted the wrist, and one spun the manipulator. Five Hitec 32645S HS-645MG High Torque servo motors actuated the arm, one motor for each joint with the exception of the base, which had two. The arm and gripper were controlled with a roboRIO (National Instruments) and a Digilent Motor Adapter. Code for the robot was written in LabVIEW 2015. The TIHRA finger was modeled in Nastran and subjected to strength testing, so that it could be compared to its inspiration, the traditional Fin Ray® finger, and to verify it outperformed its predecessor. The TIHRA gripper was evaluated as part of a four DOF arm used RoboSoft Grand Challenge, so that we could determine its successes and failures in a more realistic setting. When the fingers were subjected to a 5 N load (Figures 6A,C), the simulated traditional finger moved 8.14 mm, while the simulated TIHRA finger moved 9.17 mm, approximately 15% further. Similarly, when subjected to a 10 N load (Figures 6B,D), the simulated traditional gripper moved 16.8 mm, while the simulated TIHRA finger moved 19.0 mm, approximately 15% more. The larger movement shows that the TIHRA gripper can move farther toward the object with less force, resulting in a better grip for a smaller actuation. Figure 6. The tip of the TIHRA finger moves approximately 15% further than its traditional counterpart for both 5 and 10 N loads. (A) The traditional finger subjected to a 5-N force. (B) The traditional finger subjected to a 10-N force. (C) The TIHRA finger subjected to a 10-N force. (D) The TIHRA finger subjected to a 5-N force. The TIHRA gripper also exhibited a larger contact area with the surface of the cylindrical object. A larger contact area means and more stable grip and a smaller chance of the object being dropped. The TIHRA gripper was capable of holding approximately 40% more than the gripper with traditional fingers. As shown in Table 1, the TIHRA gripper was capable of holding an average of 560 g, while the traditional gripper was able to hold an average of 390 g. The difference was analyzed using a t-test and is statistically significant (p ≪ 0.001). The SDs for the grippers were similar and close to 10 g, which is reasonable given the experimental protocol. Table 1. Values for the strength trials conducted for the TIHRA Gripper and the traditional, Fin Ray® Effect gripper. During the lateral trials, the joints of both grippers began to separate from the motor holders at loads of approximately 300 g. This prevented us from determining a maximum grip strength for this orientation. Separation did not occur in the vertical trials, but since the gripper will need to be able to pick up objects in either orientation, improvements will need to be made to the gripper/motor holder interface to overcome this issue. We evaluated TIHRA’s performance in the Grand Challenge and summarized it in Table 2. TIHRA was able to successfully reach all objects except one in the most challenging obstacle scenario. In the pick and place challenge, an assortment of objects was presented to each team. Each team chose four of the objects. We chose the ice cream cone, the wrench, the water bottle, and the Tupperware container. The goal of the challenge is for the robot to pick up each object and place it in a specified box on the floor. TIHRA successfully picked up and deposited the ice cream cone in the container without damaging it; however, it dropped both the wrench and water bottle and was unable to orient into a favorable position to pick up the Tupperware. The second challenge involved maneuvering the gripper through or around cylindrical pillars to touch a can. TIHRA successfully completed the easy and medium difficulty obstacle challenges but was unable to complete the most challenging task. The third challenge required the robot to grip a door handle, turn it, and open the door. TIHRA was able to reach the door and grasp the handle, but the arm was unable to exert the necessary force to turn the handle of the door. Table 2. A list of tasks in the manipulation challenge portion of the RoboSoft Grand Challenge and the performance of the active gripper. 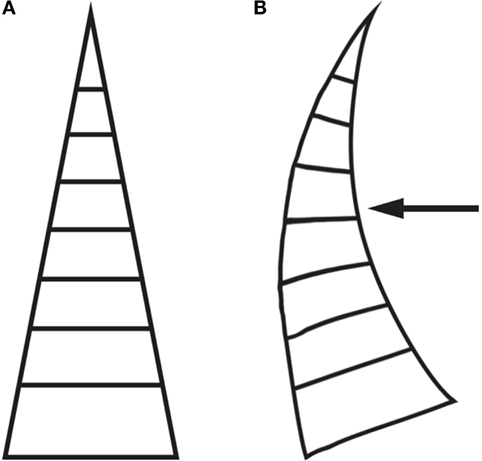 Comparing the TIHRA finger model to the traditional finger model showed that the changes made to the Fin Ray design increased the ability of the gripper to conform to an object. The TIHRA gripper also outperformed the gripper equipped with traditional fingers in grip strength testing. In the RoboSoft Grand Challenge, the TIHRA gripper performed well in some aspects but poorly in others, elucidating both areas of strength and areas in need of improvement. Both the physical testing and the performance evaluation have shown that the gripper excelled when picking up a load as long as lateral and torsional forces are minimized. Improvements will need to be made to the gripper design to better handle deformations and failures resulting from these forces. 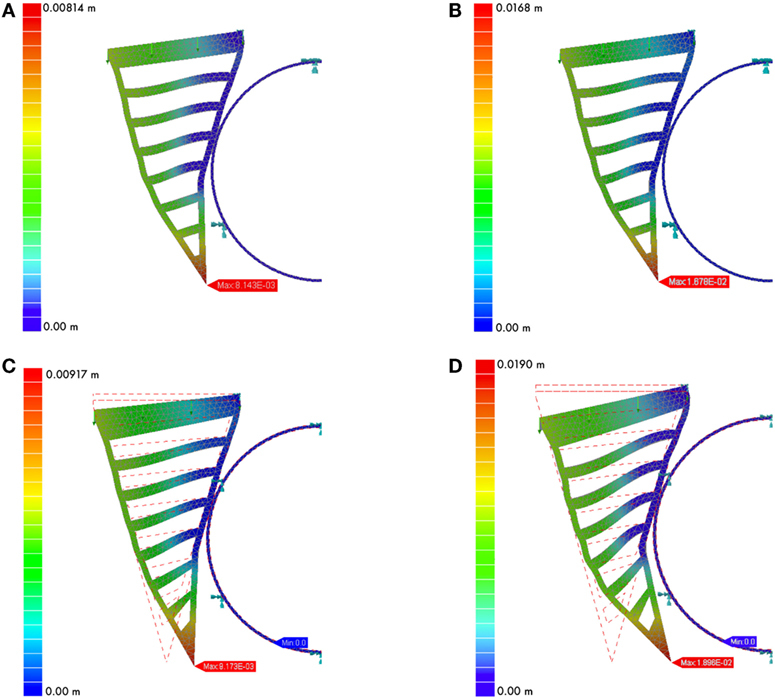 The results shown in Figure 6 support the observations we made about the differences between the traditional Fin Ray® Effect structure (Figures 6A,B) and the modified design used on the TIHRA gripper (Figures 6C,D). The tip of the TIHRA finger deforms more when subjected to a force, which in this case results in a 15% larger deformation for the same force. Thus, less force is needed to achieve the same grip as the traditional grippers, such as those used by Festo (2009, 2011, 2012, 2014). This is due to the preferred bending direction of the TIHRA gripper. Additionally, the TIHRA gripper shows a larger contact with the cylindrical object meaning that the TIHRA gripper is capable of a more stable grip on the object as it is able to conform to more of the object when deformed. As expected from the modeling results, the TIHRA gripper’s greater ability to conform to objects results in it being able to carry a greater load than the traditional gripper. Both grippers were printed out of the same material and thus were subjected to the same material strength limitations. Although printed from the same material, the TIHRA gripper outperformed the traditional gripper by 40%. This supports the hypothesis that the modifications made to the Fin Ray® Effect finger allowed the TiHRA gripper to hold more weight because it had a more complete and stable grip than the traditional gripper. 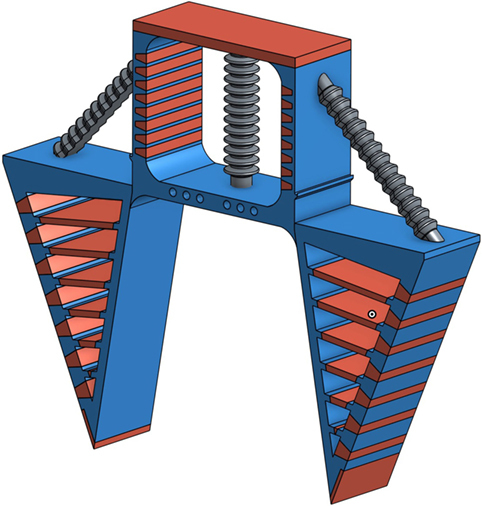 Due to the failure of the grippers to complete the lateral load experiments, the interface between the joints and the motor holder should be redesigned to prevent separation and decrease deformation under lateral loads. The redesign should also consider increasing the load the gripper is capable of holding, so that it can of holding a wider range of objects. The target load for the gripper is approximately 2.5 kg (or 5 lb). From Table 2, it can be seen that TIHRA performed well in some portions of the manipulation challenge but not in others. The successes of the gripper included the fingernail, and its ability to conform around objects. The fingernail enabled the gripper to slide along a surface in to pick up an object. Much like human fingernails, TIHRA’s fingernail was able to get under thin objects, like the small, thin wrench, and pull them away from the surface before closing fully to grasp the object. The gripper was also able to conform to objects, like the ice cream cone, without damaging them. Additionally, the success in picking up the ice cream cone highlighted the gripper’s ability to handle delicate and fragile objects without breaking them, which is an area of difficulty for hard robotic grippers. A major source of poor performance in the challenge was not the gripper itself but rather the arm design. While the arm enabled the gripper to reach many of the objects, it was often impossible to orient the gripper into a configuration ideal to complete the task. Because of this, either the gripper could not close fully around the object (e.g., the water bottle) or the gripper could not reach an object from a favorable angle (e.g., the Tupperware). Additionally, the torque supplied by the motors was not enough to overcome lifting the manipulator with a large load, especially when lifting the arm from certain configurations. These issues resulted in unstable grips and poor motion. The TIHRA gripper’s poor performance can also be partially be attributed to its lack of ability to exert the force required to complete a task. When TIHRA attempted to lift the water bottle, the lateral deformation of the gripper as well as slipping from the grip caused the gripper to drop the object. This exacerbated by an incapability to position the arm, so that the gripper was in an ideal orientation with respect to the object as well as an incapability of the arm to lift the additional load. When tasked with opening the door, TIHRA deformed by twisting and could not provide enough force to turn the handle. Improving the gripper to better withstand lateral and torsional forces as well as attaching it to an arm with more degrees of freedom would help solve these problems. 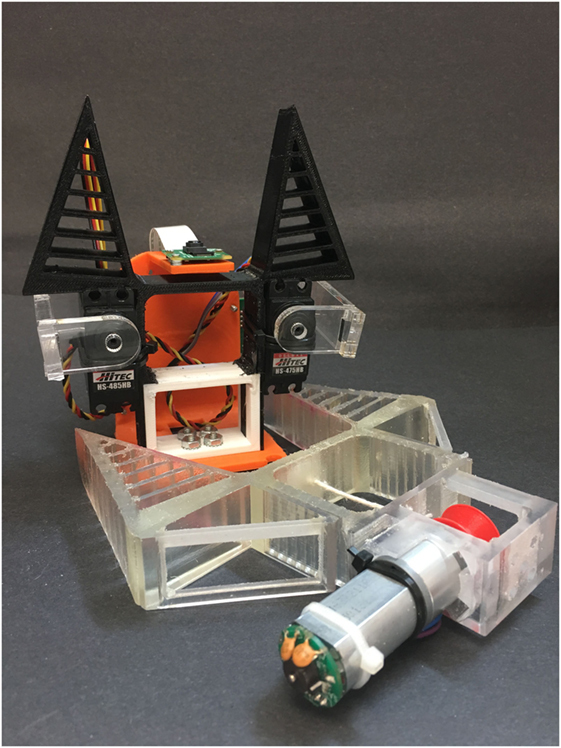 To demonstrate that the TIHRA gripper was versatile and scalable, the gripper was outfitted with a Raspberry Pi Zero and camera and attached to a Baxter Robot (Rethink Robotics). The TIHRA gripper for Baxter was scaled down, 3D printed with different materials, and actuated by servo motors. A pneumatic version of the gripper was also developed to increase the softness of the gripper for use in the robotic assistant, TIHRA. The motor–tendon driven hand was scaled down, so that it could be printed on a FlashForge Creator Pro, which is an inexpensive dual extrusion 3D printer. The hard material used was PLA, and the soft material was NinjaFlex. The fingers were altered from the original version to be entirely soft because small interfaces between PLA and NinjaFlex are prone to breaking. This version of the gripper, which is shown in Figure 7, was outfitted with two servo motors that pushed the fingers down and together. This version of the gripper is able to pick up objects in the same way as the original gripper, illustrating that a diverse range of material can be employed when fabricating the TIHRA gripper. Figure 7. The NinjaFlex/PLA TIHRA gripper equipped with a RaspberryPi and an attachment for the Baxter arm is shown next to the TangoPlus/VeroClear gripper used in the testing and the RoboSoft Grand Challenge. To attach the gripper to Baxter, the electric gripper was removed from the robot and a 3D printed mount was attached. The gripper along with the DC motor, a Raspberry Pi Zero, a motor driver, and a camera were attached to the mount. Using Python and ROS for LabVIEW Software, it was possible to control both the gripper and the Baxter’s arm in order to pick up objects. A pneumatic version of the TIHRA gripper, which can be seen in Figure 8, was also developed in order to increase the softness of the gripper, thereby increasing safety, and to decrease the weight of the gripper, allowing the accompanying pneumatic TIHRA arm to carry a greater load. Because TIHRA will not be mobile (attaching to a bedside or wheelchair), the weight of a pneumatic system is negligible. Figure 8. The pneumatic version of the TIHRA gripper. The pneumatic system behaves similar to the motor–tendon driven system; however, there are bellows-like actuators instead of triangular supports and a tendon. The center actuator is inspired by Galloway et al. (2016) and actuated by applying a vacuum, which causes the palm to draw toward the base of the hand. The side actuators attach to the joints and to the palm. When actuated by applying pressure to the bellows, they push the fingers toward the center, an effect that is exacerbated by the joints collapsing outward. The pneumatic actuators are fabricated in a three-part mold (3D printed, PLA) using Ecoflex 30 (Reynolds Advanced Materials) and attached to the hand using Sil-Poxy (Reynolds Advanced Materials). In this paper, we presented a soft robotic gripper inspired by the Fin Ray® Effect and intended for use as part of a Tele-operable In-Home Robotic Assistant (TIHRA). The gripper fingers optimize this effect to create a preferred bending direction, producing a better and stronger grip on an object. The gripper is versatile: it is capable of being actuated by at least two different methods and can be 3D printed from a variety of materials, including NinjaFlex and PLA. Altering the base of the gripper base can accommodate different means of actuation. Modeling and experimental testing of the TIHRA gripper show that creating a preferred bending direction when implementing the Fin Ray® Effect results in a gripper that needs less force to actuate, is capable of greater deformations, and is able to hold heavier loads. The gripper’s performance in the RoboSoft Grand Challenge not only highlighted gripper strengths, conformability, dexterity, and morphology but also elucidated its weaknesses. The gripper should be redesigned to reduce deformation under lateral and torsional loads and to increase the strength of the gripper and its ability to exert force. WC designed the TIHRA gripper and alternate versions, performed analysis on the traditional and TIHRA fingers, and wrote this paper. GV and MO designed and built the arm and assisted in the development of the gripper used for the RoboSoft Grand Challenge. WC, GV, and MO participated as a team in the RoboSoft Grand Challenge. CR and WM served as advisers to the project and assisted with funding. The authors would like to acknowledge the following grants and funding sources: National Instruments, NSF Award DBI-1126382, NSF IGERT Grant 1144591, and NSF Award 1444926. The authors would also like to acknowledge Tufts University, The Center for Engineering Education and Outreach, the Neuromechanics and Biomimetics Laboratory, the Advanced Technology Laboratory, and Scott Soifer. Funding for this project was provided by National Instruments, NSF Award DBI-1126382, NSF IGERT Grant 1144591, and NSF EEC-1444926. Bar-Cohen, Y., and Breazeal, C. (2003). “Biologically inspired intelligent robots,” in Proc. SPIE 5051, Smart Structures and Materials 2003: Electroactive Polymer Actuators and Devices (EAPAD), ed. Y. Bar-Cohen (San Diego, CA: International Society for Optics and Photonics), 14–20. Iwata, H., and Sugano, S. (2009). “Design of anthropomorphic dexterous hand with passive joints and sensitive soft skins,” in IEEE/SICE International Symposium on System Integration, 2009. SII 2009 (Tokyo: IEEE), 129–134. Jacobsen, S. C., Iversen, E. K., Knutti, D. F., Johnson, R. T., and Biggers, K. B. (1986). “Design of the utah/mit dextrous hand,” in 1986 IEEE International Conference on Robotics and Automation. Proceedings, Vol. 3 (IEEE), 1520–1532. Murakami, K., and Hasegawa, T. (2003). “Novel fingertip equipped with soft skin and hard nail for dexterous multi-fingered robotic manipulation,” in IEEE International Conference on Robotics and Automation, 2003. Proceedings. ICRA’03, Vol. 1 (Taipei: IEEE), 708–713. Pfaff, O., Simeonov, S., Cirovic, I., and Stano, P. (2011). “Application of Fin Ray effect approach for production process automation,” in Annals of DAAAM & Proceedings (Vienna: DAAAM International), 1247–1249. Shibata, M., and Hirai, S. (2006). “Soft object manipulation by simultaneous control of motion and deformation,” in Proceedings 2006 IEEE International Conference on Robotics and Automation, 2006. ICRA 2006 (Orlando, FL: IEEE), 2460–2465. Copyright: © 2016 Crooks, Vukasin, O’Sullivan, Messner and Rogers. This is an open-access article distributed under the terms of the Creative Commons Attribution License (CC BY). The use, distribution or reproduction in other forums is permitted, provided the original author(s) or licensor are credited and that the original publication in this journal is cited, in accordance with accepted academic practice. No use, distribution or reproduction is permitted which does not comply with these terms.